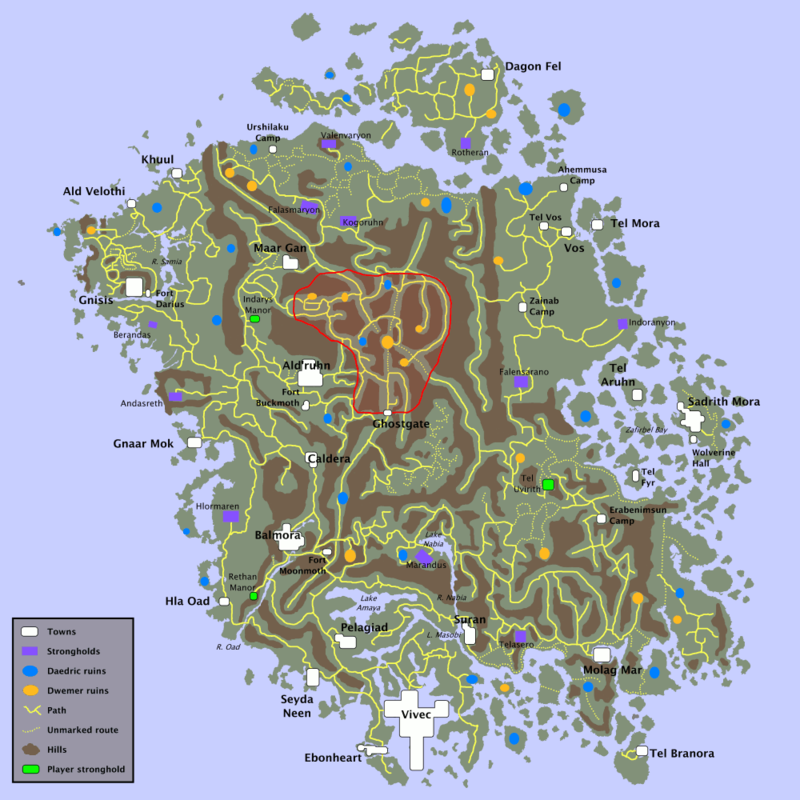 The world of Morrowind is quite immense (I believe that Oblivion world is even bigger). Sometimes you get quests that require you to go to a specific location. Sometimes it is very simple to get there – for example it might just require you to take a stilt rider, a boat or use services of the Mage Guild to teleport to the desired location. Sometimes however you get some just general directions such as “south west of city A”. The problem of course starts if you don’t know where city A is, and there is no direct transport there from your location. Usually what you do in that circumstance is to visit all your regular hangouts and see if you can find a transport there. Chances are that you will, but you may spend considerable amount of time or money by doing this. Sometimes it is easier to just look at a map – but the in-game map is “fog of war-ed” so to speak, and only reveals the locations that you know about. First map is essentially a road map with all the major towns, ruins, and strongholds marked. I found it to be extremely useful reference guide when doing various quests. 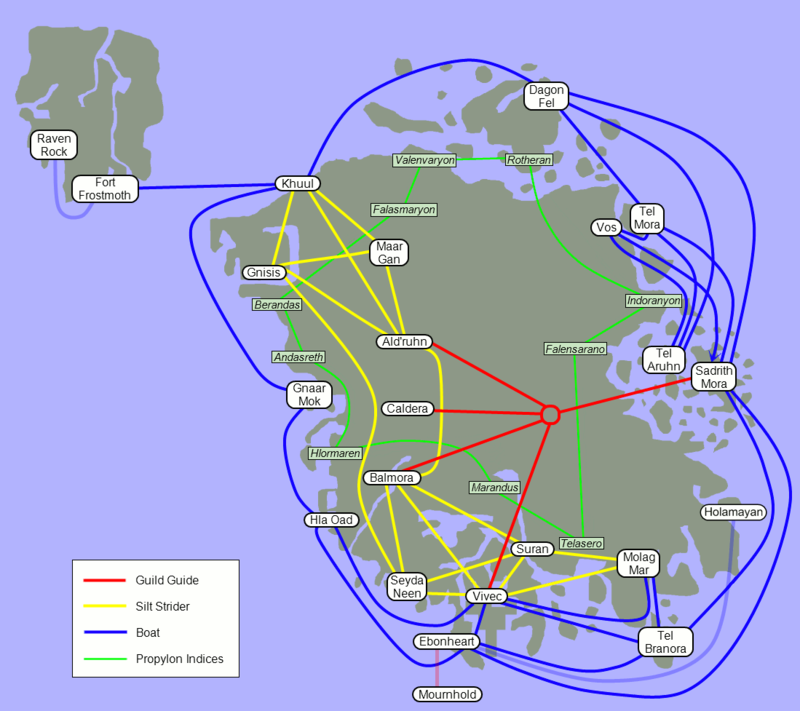 The second map shows you all the quick travel routes – extremely useful when you are looking for the quickest route from point A to point B.
I was just now poking around on Google Images and was suprised to see your blog come up with some Morrowind game maps that looked very familiar — I happen to be their creator! Glad you liked them. Best wishes and happy playing. Awesome! They were really helpful game aids. Thanks to them I was able to plan my trips using the shortest most direct fast travel routes, and actually navigate my way around the world. Thanks for creating them! I hope you don’t mind me reposting them here like this. Odd, you didn’t get your own paper map with the game? It was exquisitely detailed, marked a few caves, ruins and shipwrecks (for treasure of course! ), showed you the paths and location of fast travel services and had all the major sites clearly labeled in English with ruins and whatnot marked with Daedric script. In fact, I suspect some quests were meant to be navigated with that map, since it’s obvious you don’t know the location of the places they mention offhand. Look for it in Google, it’s there somewhere. Tribunal’s and Bloodmoon’s too. Nah… I got Morrowind from a bargain bin in a jewel case for $9. Best 9 bucks I spent evar! Later I bought the bundle set with Tribunal and Bloodmoon but I don’t think it had the map either. Unless my brother took it and stashed it somewhere. Oh well. I had to spend that cash and the map is really pretty. Lookie! You might find some things hidden around. @alex: Or get a spell resist magicka 100%, cast it, put on boots of blinding speed, then use any levitation spell – you will be zooming around the map like crazy. anyone know if fort frostmoth is in the xbox version?